All their garments are 100% cotton and handmade. The brand also does personalise clutches, nappy clutch and makeup bags, muslin clothes and new born sets as well, which I believe are so sweet with tiny little hat and blanket. I absolutely love everything about the Happy Meadow designs. Their designs are very dainty, clean and unique. The choices of fonts and colours for personalising products and slogans are also very sweet and romantic. According to their website, as all designs are hand drawn, there can be variations. So there will be always something fresh and new in a store. As more designs are adding to the line, there is something for every occasion. We got two beautiful baby personalised sleepsuits to try on. 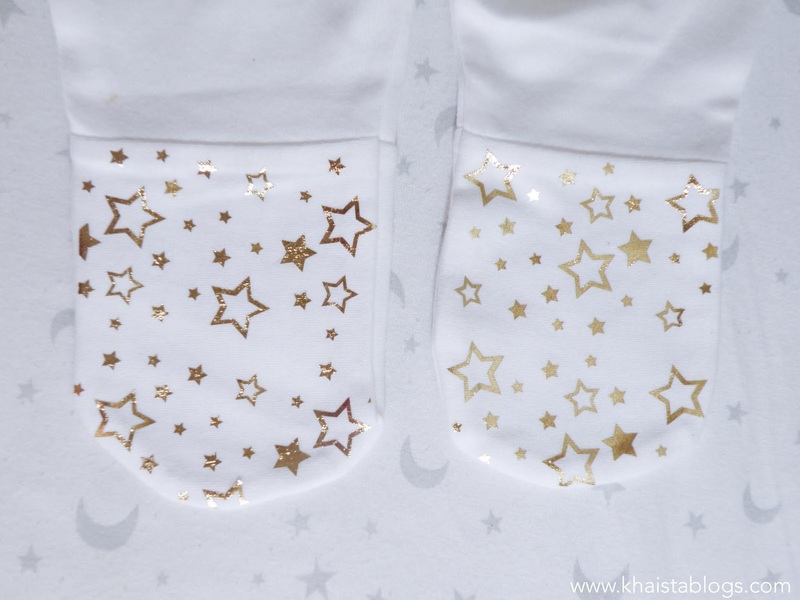 One sleepsuit has a silver woodland fairies design which is adorable and my favourite and other sleepsuit has sweet dream moon print in golden. Sweet dreams sleepsuit has star pattern on feet as well. The material of sleepsuits is 100% cotton. They are very soft to touch and very well made. Sleepsuits come in three sizes, 0-3, 3-6 and 6-12 months. We got size 6-12 months because Mantasha is now 9 months. She was looking absolutely darling in pink woodland fairies sleepsuit, however size was not a perfect fit. This could be a bit better as babies grow differently in first year and one size for 6-12 months is not fit for all. *Disclaimer: This article contains PR samples and some links may be affiliate links. However all views are my own. These are so pretty, I love the designs on these. How sweet are these?!?! I am a sucker for personalised things as although I chose unusual names for my daughters, you can never find anything with their names on. I would have loved this when they were babies. Great brand! These are so sweet! I love that the design is in foil, adds a bit of glam.